I’ve desperately wanted to learn how to make my own ice cream for years. A lack of an ice cream maker put that on hold for a while, though. I tried the (very good) method of buying top quality commercial ice cream and adding special ingredients for dinner parties, but it wasn’t quite the same as making from scratch. Luckily for me, last year for a (ahem) ‘special age’ birthday, my lovely parents-in-law gave me a KitchenAid mixer a gift. I’ll go into all the thousands of reasons I love my Kitchenaid another day, but I will say one of those reasons is ICE CREAM MAKER ATTACHMENT. No, you don’t need a KitchenAid to make ice cream. You don’t even need an expensive ice cream maker. I’ve seen them on special for as little as $30. Keep an eye out at those sales. They’re a handy little toy to have in the kitchen. I will be adding a couple of posts in the near future that go into more detail so far as ice cream making is concerned, including recipes that don’t always need a specialty machine. 300g of best quality dark cooking chocolate, roughly chopped. Best quality means best quality. You need a minimum of 60% cocoa. Trust me on this. I’ve tried to cheat. It doesn’t work. At all. 2 teaspoons of vanilla extract. In a perfect world, this means pure vanilla extract. I didn’t have that this time, so used the artificial stuff. 155 grams of caster sugar. I’ve made this dozens of times now, and except for the time I used cheap chocolate buds, it’s never failed me. The one thing I always do before beginning is to have all my ingredients ready and lined up on the bench. That means sugar weighed, eggs separated. Step One: Place cream, milk and chocolate into a large metal bowl over a saucepan containing simmering water. Be really careful not to let any water or steam come into contact with your chocolate or it will seize. Cook cream, milk and chocolate over a low heat, stirring occasionally until it comes together as a smooth mixture. Step Two: I use a wire whisk on my Kitchenaid for this step, but you could use any electric mixer. 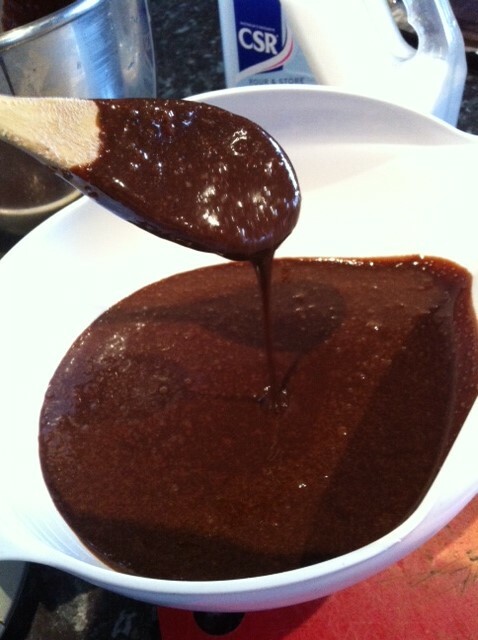 Place the chocolate mixture into a large bowl and allow to cool for about 10 minutes. On a low-medium speed, begin to mix. Add the vanilla, egg yolks (one at a time) and sugar. 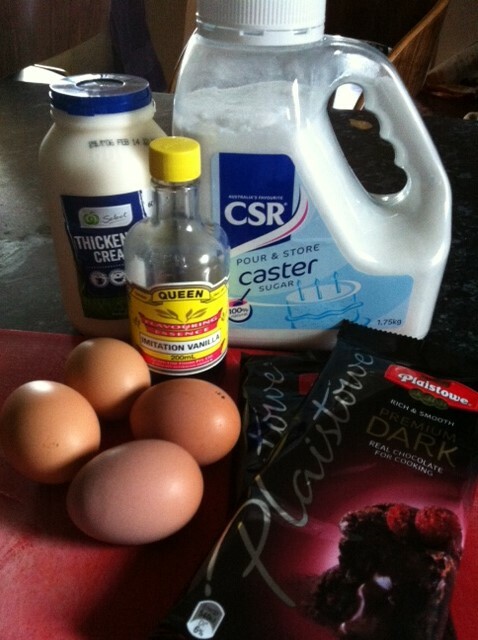 Once all ingredients are added, mix for one further minute. Remove the mixture and place in the refrigerator to chill for around half an hour. I’ve been known to leave it at this step overnight. Step Three: The churning bit. With most ice cream makers, there’s a special bowl that needs to be frozen to use. The principal is that they’re hollow and filled with a liquid that freezes solid. I keep mine in the freezer all the time it’s not in use. That way, it’s ready when I need it, rather than having to think 24 hours in advance. The most common mistake when making homemade ice cream is not having this bowl sufficiently frozen. I try to make sure my chilled chocolate mixture is in a bowl that’s easy to pour from, just to try and cut down on the mess factor. 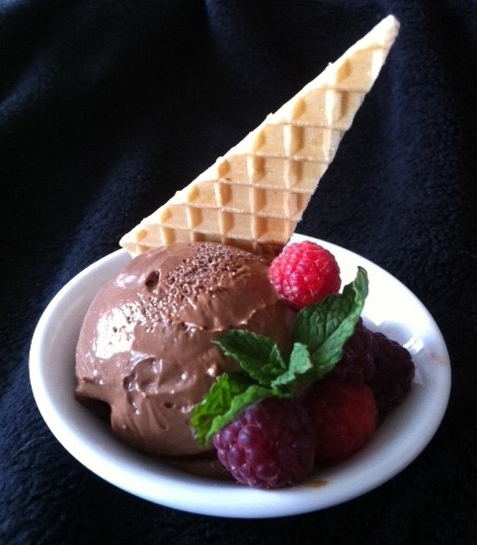 Following your ice cream maker’s instructions, turn the machine on and slowly pour in the chocolate mix. Churn for around 25 or 30 minutes – obviously this will vary between machines. 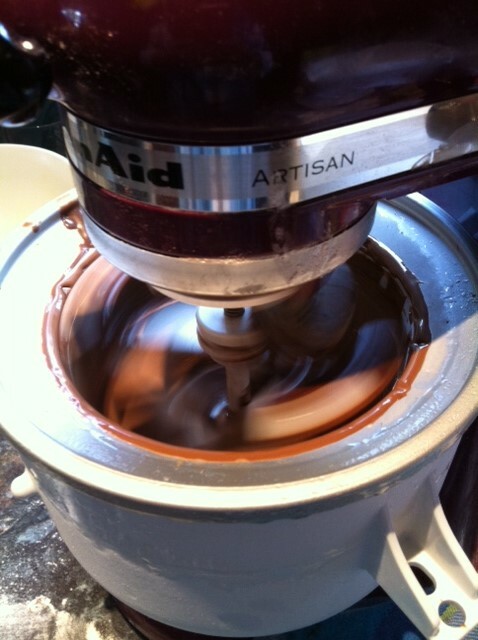 The KitchenAid starts to make a ‘clicking’ noise as the ice cream rises up the paddle, letting you know when it’s ready. At this point, your ice cream will be more like a soft serve than anything you can scoop, so it really needs to go back in the freezer – covered – for about two hours. For the recipe I’m making later in the week, I froze mine in a square slice tin. Enjoy with strawberries, raspberries or simple whipped cream. *It’s important to eat your chocolate ice cream within four days due to the raw egg factor.